What is everyone planning for winter cletrac projects? 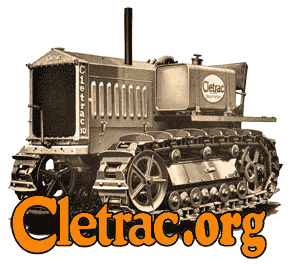 Cletrac.org > Cletrac Tractor Discussion > Subjects Related To All Models > What is everyone planning for winter cletrac projects? Things have been slow I thought maybe this would kickstart some discussion. I am hoping to finish up my HG-42 and then finally after 10 years get to start work on my E-62. Re: What is everyone planning for winter cletrac projects? Just now saw this post and new to the site. Also new to owning a 1945 Cletrac. Been working on it for the last couple months in my spare time. I don't know much of anything about Cletrac's but have several old tractors and 2 other crawlers, a 1935 Two Twenty Cat and a 1955 TerraTrac fully restored. I found out from Zimmerman what year it was and then discovered it was originally painted an orange color but someone had painted it green and put newer HG decals on it. Don't understand that. I will try and post some pictures of things as soon as I figure out how. Collecting many tractors, mostly Allis, Minnie, Massey and an assortment of small crawlers. Finished the tool box and battery holder, will not quite, dropped the cover on the floor and now get to repaint plus don't like how the tag on the battery turned out so will take it off again and see if I can do a better job on it. Just about done with the carb, has a Tillotson model Y-8D carb.